Two groups — one created by the mayor and the governor, the other consisting of tourism and business leaders working behind the scenes — are zeroing in on sources of money that could help address the New Orleans Sewerage & Water Board’s immediate and long-term spending needs. Members of both groups say many decisions remain, but they believe that by the end of the month they can find ways to raise most though not all of the money that Mayor LaToya Cantrell wants for the beleaguered agency. If they are correct, that would deliver a high-profile victory for Cantrell less than a year after she took office and would validate her politically risky move to challenge the tourism industry publicly, while others said she should have engaged in quiet persuasion instead. A deal also would be a victory for Gov. John Bel Edwards in a year that he is seeking re-election against two Republican opponents. Cantrell began demanding a diversion of dollars from tourism to the S&WB in October, a move that rattled hospitality industry leaders and led to public strife between the two sides. Edwards decided he ought to help her effort, elected officials and business leaders said privately, both because of New Orleans’ overall importance to Louisiana and because it offered him a chance to show business and hospitality leaders that he can lead effectively only months before voters will decide whether he deserves a second term. New Orleans will provide an important base of voters for him in that election. The 22-member working group created by Edwards and Cantrell has been meeting with the governor’s staff to identify available federal or state money to pay for repairs aimed at preventing more costly and embarrassing boil-water advisories in New Orleans — as well as preventing a heavy rain from again flooding parts of the city, as last happened in 2017 while Mitch Landrieu was mayor. Cantrell is seeking $35 million to upgrade some S&WB machinery and another $40 million to pay overdue bills owed to contractors and to cover some emergency road repairs. The 2017 flooding exposed serious deficiencies at the S&WB. Landrieu depleted the agency’s reserves to fix the biggest problems. A dozen people involved in the latest behind-the-scenes discussions say they think the two groups can deliver about $50 million of the $75 million in one-time money that Cantrell is seeking. They would cobble it together from a variety of sources including federal money, a small portion of the $235 million in reserves held by the Ernest N. Morial Convention Center, a tax on short-term rentals in New Orleans and altering the structure of taxes on hotel guests. Any agreement would include an initial offer by tourism leaders that Cantrell rejected as inadequate by itself: reinstating a 0.55 percent sales tax on hotel rooms that just expired. That would provide $6.7 million a year to the city. It’s not clear whether the hospitality industry will accept a recommendation of the Bureau of Governmental Research, a nonpartisan group that in January called for giving the city an additional 1 percentage point of the sales tax now charged on hotel rooms. This would provide $12.3 million per year to the city. “I think we’ll (agree on a plan) by the 28th,” said one member of the mayor’s and governor’s working group, who spoke on condition of anonymity. The group is scheduled to meet next on March 28 in Baton Rouge, and Edwards is planning to attend, which could be a sign of an impending announcement. The governor has involved many of his top advisers, including his chief of staff, Mark Cooper, and executive counsel, Matthew Block, in the effort. Members of both groups want to find a solution before the two-month legislative session begins on April 8. 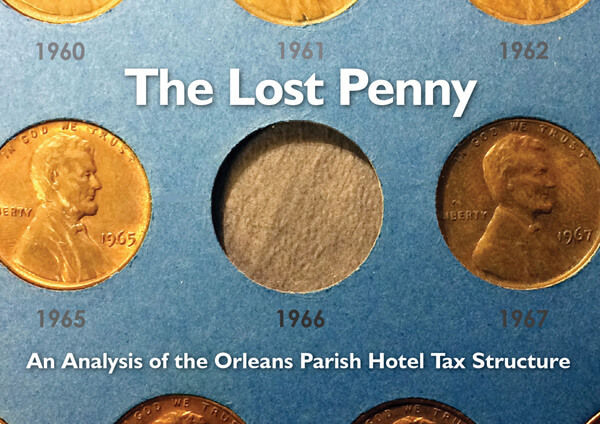 Some of the money for the overall solution will likely require legislative approval, but those involved emphasize that the money would primarily be paid by visitors to Orleans Parish, not by Louisiana citizens. Besides the one-time payment, Cantrell also has been seeking $40 million in annual revenue to help pay for the S&WB’s operations. Sources said she is likely to get $20 million to $25 million. Apparently, a chunk of this money would come with the blessing of the hospitality industry. If the city obtains enough money to satisfy Cantrell now, business and hospitality industry leaders have indicated privately that they could assist the mayor in trying to win voter approval to institute a drainage fee on all properties in the city — including those owned by nonprofits — to provide additional money for the S&WB on an ongoing basis. The fee could raise $40 million per year. Business leaders said they are insisting that city officials establish safeguards to ensure that the extra money Cantrell is seeking for the S&WB would be spent as promised. “The real importance of the business groups is to figure out how they can work with the city and provide an oversight,” said one business leader, who spoke on condition of anonymity. Key members of the working group convened by Cantrell and Edwards include Bill Hammack, a co-owner of the Link Restaurant Group; Paul Flower, CEO of Woodward Design+Build; and Leslie Jacobs, who owned an insurance agency and has long played a leading role in education policy-making. Members of the group of tourism leaders include Stephen Perry, president and CEO of New Orleans & Co., the organization that promotes New Orleans as a site for conventions and group visits; Darryl Berger, a prominent hotel developer who chairs the New Orleans Tourism Marketing Corp.; and Melvin Rodrigue, who runs Galatoire’s restaurant and chairs the Convention Center board. Also participating are Gregory Rusovich, CEO of Transoceanic Trading and Development Co. and immediate past chairman of the board of New Orleans & Co.; Michael Hecht, president and CEO of Greater New Orleans Inc.; and Jim Cook, general manager of the Sheraton New Orleans Hotel. John Pourciau, the mayor’s chief of staff, has been Cantrell’s point person in all of the discussions. The mayor’s and governor’s offices declined comment on the talks. Perry, who is leading the group of hospitality and business leaders, said he has been in a series of meetings over the past two months, including one on Tuesday with Edwards and Convention Center officials. He said hospitality leaders want to do their part but can only do so much. “It’s about making sure the solutions to problems do not impair the growth of tourism — the (city’s) No. 1 economic driver — while getting the S&WB healthy and starting the long-term care of infrastructure. We share those goals with her,” Perry said in an interview. In January, Perry raised Cantrell’s ire by questioning the city’s ability to effectively spend any tax dollars redirected from the tourism industry, given its problems like a high crime rate, dirty streets in the French Quarter and the S&WB’s well-publicized failings. Perry said his comments were not directed at Cantrell, whom he praised for attempting to solve the S&WB’s financial woes. “It’s not a battle between us and this mayor,” he said. One key player in getting one-time money from the Convention Center will be state Senate President John Alario, R-Westwego, who on Friday said he had yet to be included in the discussions and who voiced his concern about diverting tax money. “The money needs to be reinvested for what it was originally intended: to create jobs and bring in tourists,” he said. But other legislators were optimistic that all parties could come together. “I’ve been impressed by everyone’s coming together to come to the table to find a solution,” said state Rep. Royce Duplessis, D-New Orleans, a member of the mayor’s and governor’s working group.